How do I export a high quality movie from Final Cut Pro 7 or FCP X? Click which program you’re using. We recommend exporting a Master File for every project you do. This will give you the highest quality file possible. Why would you want a Master File? The Master File serves as a mezzanine file, which is used to archive your project in the highest possible quality. This way, you can use encoding tools like DV Kitchen to transcode your mezzanine file to any current or future format. This will export a file using the same audio and video settings as the source footage, ensuring it’s the highest quality. In the case of the video in the screenshot, it’s Apple ProRes 422, but depending on what camera you used, the source footage may be a different codec. 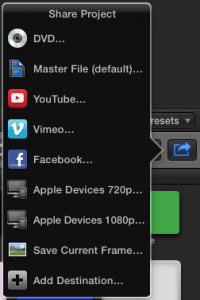 You can upload your files directly to Vimeo, YouTube, or Facebook using the Share function. 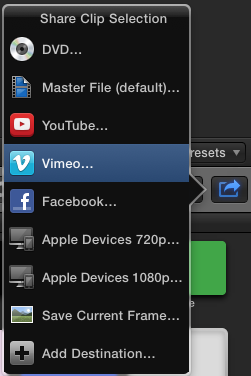 YouTube has slightly different settings options than Vimeo and Facebook, which are noted in the settings instructions. Other than that, they’re identical. 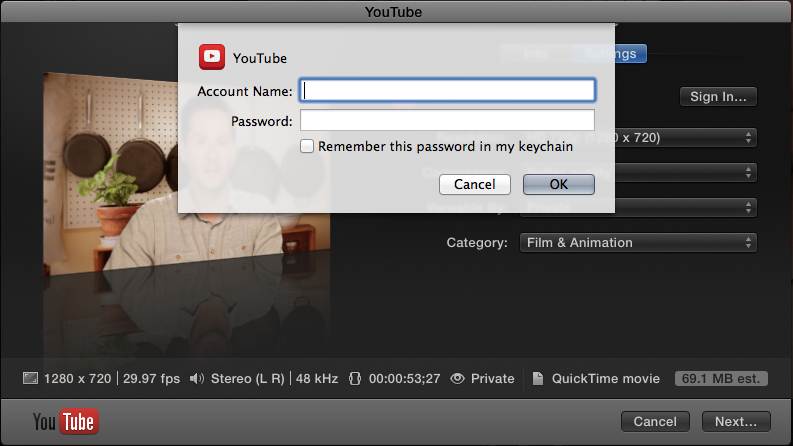 Once you sign in, FCP X will post your video directly to YouTube, Facebook, or Vimeo if you are connected to the internet. YouTube, Vimeo, and Facebook will allow you to post HD 1080p videos, but most people do not have fast enough internet to stream 1080p, especially if they’re watching on mobile devices using data plans, so HD 720p is a happy medium. Remember that YouTube, Vimeo, and Facebook will compress your video again, so you ALWAYS want your Compression setting to be Better quality. By keeping your video private, you can watch the video first and make sure it looks great before sending it out into the world. Get free tips and deals direct to your inbox! In Final Cut Pro 7, there are three ways to export a high quality movie. 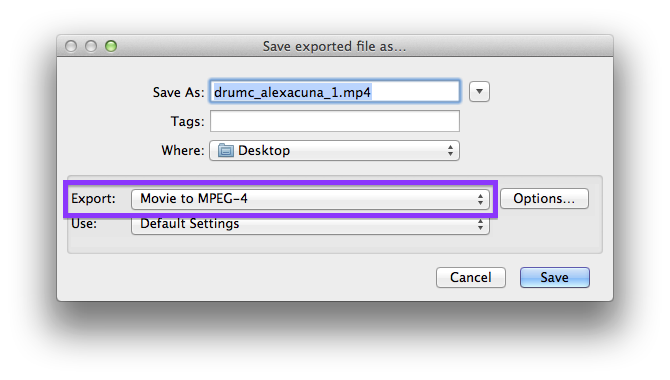 If you want to export a temporary movie as quickly as possible, export a reference movie. The exported file is fragile, and not portable. If any of the referenced video files (including render files) are moved, renamed or deleted, or if the reference movie is moved to a different computer, the reference movie is broken and will not open. This means you should use the reference movie right away, for example, to import into DV Kitchen to publish on the web. This method is definitely useless as an archival movie to save for future use. This method exports in the format of your sequence. If your sequence is in a low quality codec, like DV or HDV format, the quality of text, graphics and animations will be bad, so use another method. Questions? Ask in the Final Cut 7 forum. If your sequence is in a high quality format, like Pro Res, or Uncompressed, this export method will result in a high quality movie you can archive, and encode to many different formats later depending on what you need. This method will export a high quality, very compatible movie that will play on most any screen- desktop, mobile, smart TV, OTT box, etc. 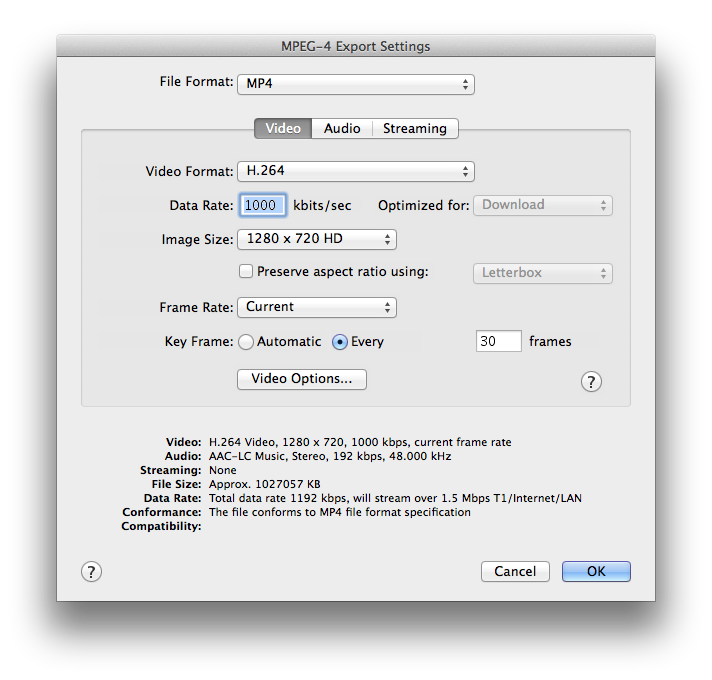 Set the video options like this to export a 720p movie at about 1000 kbps (for video). (Obviously, if you want to export a different resolution, choose it here. Here’s some info on choosing a bitrate. Click OK and OK and your movie will start encoding and exporting. Unfortunately you will have to set this up each time, as there is no way to save a preset. While your movie is exporting, check out the free 20 day trial of DV Kitchen! Images of Motion 5 and Final Cut Pro X? What’s the best way to deinterlace in Final Cut Pro? Well, that makes since, however, would it not be super large, like if you where running a 30 minute film it would be easy 7 GB so, that will not really work for the web…. Once you’ve exported using this method, you can encode into any format with the best possible results. I’m new so, I hope I’m posting in the right area. We made an independent movie about homelessness. A full feature. Running time with credits is 1 hour and 52 minutes. We built an ENCORE file from a QT MASTER (895 gigs) which was originally exported from a FCP MASTER. In the ENCORE “BUILD” there are white specks and black specks/artifacts, particularly where there is a higher level of bright light. i.e. when a headlight shines on someone’s face. NOTE: 4 weeks ago, we had previously performed the exact same process, using ENCORE, with the same Blu-Ray burner and there were NO issues whatsoever. Since then we have added about 2 minutes of footage (including a 10 second green screened sequence) to the master FCP MASTER, which looks great (no artifacts) then exported to a QT Master, which also looks great (no artifacts), then built it on ENCORE. Now we have this issue with the specks/artifacts. I’m trying this method right now but I have a question. Are you saying to export to this uncompressed format, then take that into Compressor to make the m2v files or are you saying avoid Compressor and take the uncompressed files directly into DVDSP and let that encode the m2v files? Daniel, you can do either, the quality is the same. Try both and see which you prefer. I have done what you said with the exporting process within FCP, and the file is 80+GBs. When I import it into DVDSP and starting encoding the file, the video bit-rate was too high came up. I went into preferences and lowered the minimal and max size to 5mb/s and 7mb/s and it still did it. Any ideas? Using your settings, my export from FCP went up from 45minutes to 7 hours for a 110min video. Turns out it eats up a lot more disk space (well, duh). I ran out space, so I can’t report back about my results. I will run a short test using the new settings and compare it to the old settings. I tried burning a disk using IDVD with the source being uncompressed Quicktime 4:2:2 8 bit… and have field image break ups. Does IDVD (consumer verison included in “I Life” package) not do uncompressed video? i little help would be nice! thanx! Thanks a lot for this tip!!! Hi, I read your suggestion and I try it, but that’s waht happend I capture some test clips like 45 seconds, from a mini Dv panasonic camcorder usin the easy setup from FCP 5, DV-NTSC (match the sequence to that settings) and exported using the current settings method then I used you’r method, then I view the two exported clips in quick time and I was very happy with the cuality of the titles in the 8 bit format there were great. Then I make a DVD using iDVD and when I look the clips in my TV the DV look good and the 8 bit look like crap, so I re-capture the clip using the 8 bit uncompressed settings (match the sequence to that settings) and exported using the 8 bit uncompressed make another DVD in iDVD and the titles still look bad in my TV. I’m doing something wrong? i’ve been trying your suggestion and i’m quite satisfied with the result. i used idvd after exporting my video clip in uncompressed 8-bit. after burning it’s all fine. but now my question is, i need to give the file to my boss and he will himself include the clip to a final dvd. when we export using quictime movie, the file is using FCP application to play it but i don’t really know if they are using FCP or Premiere. is there an export that still keeps the same quality but become a quictime file so they can use it with different players other than just FCP. it need to be as good quality as possible and i’m working with Dance video so there’s a lots of fast movement. i would really appriciate if you can help me since i’m fighting with this exporting since ever!!! other wise if i’m burning the dvd myself it’s just perfect and i thanks you again for the tip. I’m reading that it’s better to export to dvd-r 4x or lower for good results. Is this true? What’s the difference between 4x and 16x? Also, a very basic question (first time exporting to dvd) – does my project remain as it was in the fcp timeline even after export – that is, am I exporting a duplicate of the project or the actual project?. I have about 86 minutes, shot on mini dv PAL & need to create dvds for film festivals and tv braodcast. Please, explain it to me as if I were a child!!! I followed the procedure. My movie is 17:41 min. long anamorphic (2:35:1). When I export uncompressed as suggested the movie gets cut off at 14:10 min. I tried opening in both FCP and Quicktime. Same result. Everything has been rendered. If I export using Quicktime Conversion iinstead, at HD DVCPRO 720p60 at 24fps I don’t have any probleems and the movie will get exported in its entirety. I have a 24 inch Intel Core Duo Mac with 1 GB RAM. 23 GB available in hard drive (after movie has been exported), using FCP 5.1.4. 1. What happened with the remaining footage? Why is the movie getting cutoff? 2. Also, when exported uncompressed, why is the movie not in anamorphic format? 3. Will I get a similar result (in terms of quality) if I export using HD DVCPRO 720p60 instead of uncoompressed? Any suggestions will be very much appreciated. Just to clarify, did you guys turn on the “High Quality” toggle (apple-J in quicktime pro, inside video track) when viewed in Quicktime? It’s normally turned off, resulting in bad image “viewing” quality. However it should still look fine once you put it into DVDSP and rendered. IMHO, DV’s good for 80-90% of the applications out there… while 8-bit uncompressed is only for “ABSOLUTE” pro work. Even then, if your original source was DV then you are just decompressing them, recompressing them, and then compressing again (DV -> 8-bit -> MPEG2). This is redundant, time consuming, space-hogging, and the resulting quality isn’t that much better. The only reason for me to use 8-bit uncompressed is if my original sources where Digital-Beta from film or something, and I’ve captured it uncompressed to begin with. Only titles, graphics and animations will benefit (quite a bit, as seen above) from exporting uncompressed. DV footage won’t look any better. As long as you render the titles, graphics and animations in a uncompressed timeline. If you render them in a DV timeline quality still gets lost. So if you’re working DV/HDV render your fx/titles to 8 bit /10 bit SD or ProRes. 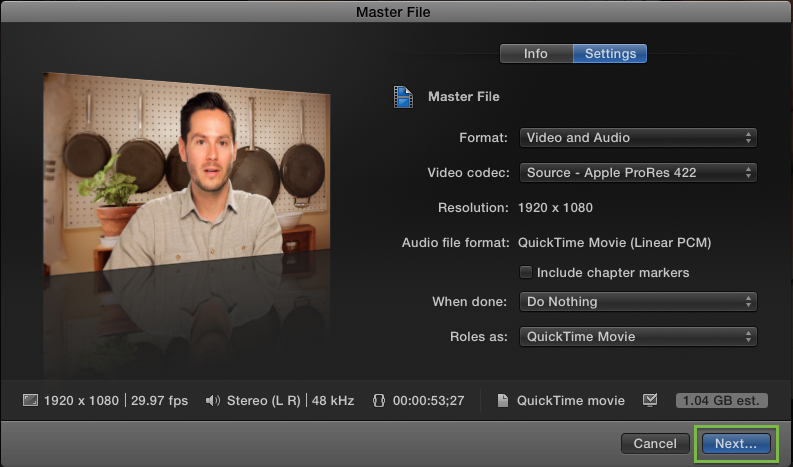 Export quicktime movie uncompressed. And encode in application of choice. How can you do this for Final Cut Express? 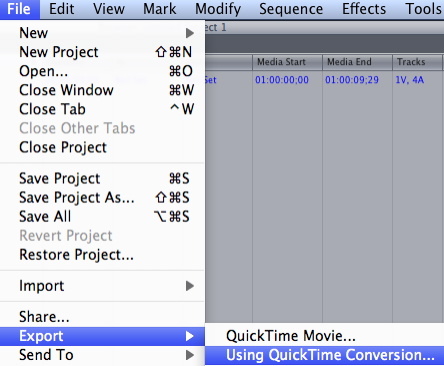 When you choose to export to quicktime, it does not offer any settings options! I’m with Randy on the FCE question. I’m having a horrible time exporting a decent copy of my game footage. With FCE, you could output with QT Conversion, then choose PJPEG at 75% or better. I did the png export with a 24p 16:9 project, following the directions here precisely. The titles look great but when I create a dvd in idvd using the 16:9 setting, it seems to be letterboxing it. I do not have the “preserve aspect ratio with letterbox” checked. It doesn’t seem to matter if I convert from the original fcp movie to h.264 or use the fcp movie (which is beautiful quality 16:9 and not letterboxed in QT). As soon as the dvd pops out, it will only play on the pro monitor correctly with the 4:3 setting. On the 16:9 setting, it is stretched. I have successfully made 16:9 dvd’s using the regular dv export from FCP but at the cost of my titles looking bad so I don’t want to go backwards. Any idea if there is something in the png codec that maintains the 720×480 aspect regardless of the aspect of the actual project? Is there a fix? Am I missing something? I am baffled. Any thoughts would be helpful. Thanks. Did you create a 16:9 project in iDVD? Yes. This is why I am baffled. Everything seems to be set up correctly but the mysterious letterboxing still occurs. I’m currently trying to import a Qtime movie created in FCP into DVDsp. it wont allow me to import as an asset claiming unsupported format. i understand i need to convert my original film in FCP using Export-Qtime conversion- then putting the format to Mpeg2… in my format drop down menu i have no Mpeg2 option only Mpeg4. Any ideas?? Just export using the procedure in the article above, then let DVDSP encode your assets. 2. export with PNG as you stated above. Then I used compressor with 90 min dvd best quality on both sources. I then created DVD using DVD Studio Pro. The method using PNG creates much more artifacts and interlacing issues when there is motion in the video vs export using compressor via dv. Any thoughts? Both those methods will output an interlaced movie if the footage and sequence were interlaced. Are you saying when you export to compressor your video is getting deinterlaced? Do you want your video deinterlaced? Where are you seeing interlacing, DVD preview? On a TV? Sorry Josh for the lack of clarity. The footage is DV 29.97/60i footage. It is on 29.97 ntsc timeline with DV codec. As far as the quality of the footage…..when the comedian (in this case) moves quickly on the stage you see much more of an “interlaced artifacts” (like more lines in the footage) vs the footage that was exporting using the DV codec. So I dont know how to answer the question of do I want it deinterlaced or not. I want the best footage. The PNG footage is not as “smooth” during motion as the DV codec. I see this issue both in the quicktime movie and when I go to DVD. I am viewing on Plasma monitor. I’ll check it out. But once again I burned two copies one using PNG and one using DV codec (directly to compressor). I used the DVD 90 best quality setting in compressor for both. The DVD without using PNG worked fine. It is the PNG version that is jittery but only on rapid motion parts. Because you use the word “jittery” my guess is that Compressor is reversing the fields. That, above, is what I am referring to. Once again this happens where the person is moving quickly in the footage. Compressor 3.0 is not the issue. Field dominance is set to automatic, which is the same compressor setting used for the footage created file-export->using compressor…. So my point is for me, I do not get a better quality DVD using the PNG method stated above. I may try uncompressed and see if that is a problem. You will only get better quality using PNG on titles and graphics, not footage. When I’m exporting an edit from FCE with the H264 codec I Loose contrast and saturation. And checking the Internet I’m not the only one with this problem. Will the workflow at the beginning of this topic solve this problem and will I get the colors, saturation and contrast like I see/edit the footage in FCE? First, if you are talking about the Canvas Window, it is not giving you an accurate picture of your footage. I did the steps with FCE. And then used DVKitchen. But the film is looking the same as exporting directly to QT (H264). More washed out and loosing saturation. And I though that this problem would be solved with DV Kitchen. I’m I doing something wrong? Now I see that I have to choose de X264 encode en not (ofcourse) the H264. Didn’t see that on the bottom of the menu the first time. Now it is working fine with the colrs and saturation I edited in FCE. Great. Great, glad to hear it. I like PNG better because it is lossless, and preserves the gamma- JPEG makes the image a little darker. Now I did a test (yes its a very short film..) and in FCE I used the x264 codec directly, with the same settings as I used in DV Kitchen. And now it also looks like in FCE. So at this point it looks like there is no reason to go through DVkitchen? Or am I overlooking something? Also, to find the best settings, SampleLab is the only efficient way to determine the best bitrate. And without DV Kitchen, you lose all the other features, uploading, HTML page and code creation, shadowbox, Flash and WMV encoding, the bitraterate budget calculator, and so on. I designed DV Kitchen so that I would never have to go through these nightmares again. And now, you don’t have to, either! will this quiktime movie look good when projected on the wall and played by a DVD player? If you follow the procedure above there is no quality slider. Are you sure you set compression type to “PNG”? You’re right, there is no quality slider, but, for me as well, it shows the quality as medium and I’ve done everything like you’ve stated above. Any thoughts? Weird! Maybe try Animation codec? Hi, I followed the suggested method of exporting my FCP movie to PNG settings and the quality looks great. However, when I moved the file from my Mac to my work PC to view it, it wouldn’t open. The file size was almost 7 G on my Mac and when it appears on my PC the file size appears as 0 KB. Do you know why this is? Also, if I want to keep the same quality movie file, how can I get the file not to be as big without losing the quality. I could not even burn it onto a DVD without using IDVD. I dropped the PNG file in IDVD to create a menu and also to have the movie play once you inserted the DVD and it worked fine on my Mac but once again, when I tried playing the DVD on my work PC it would not play automatically. Confused in Massachusetts, help! There is some problem copying the file to your PC. To create a DVD, you must convert to MPEG2 with iDVD or another app. Maybe your PC cannot play DVDs. I am having the same problem with out of sync audio and video. and the only solution i see at the moment (other then going through the dvd studio pro [dsp] timeline to manually attempy to sync) is to export a native ntsc standard video because this is what has worked in the past. The problem i have is this: i have exported each chapter of a movie into its own HDV movie. sync is perfect, each is tested to make sure. compressed using compressor for SD ntsc (bitrate set for 120 minute movie) DVD. The audio and video is not synced. I have in the past for the same movie exported a NTSC SD movie via fcp, taken into compressor with no issues. Personally I am not a fan of HDV and I would easily blame the issue on this although I cannot varify this at the moment. And another side note… to import into dsp you need a file that will fit into the program, not a 7 gb file. It has to be the file size that will fit onto a dvd: 4.7 gbs. And to be more specific, the a/v file should most likely not be more then 4.3 gb because you need buffer space for the extra data that will be burned onto the dvd (give or take for whatever authoring files you include. 1. Try exporting as HDV and bringing directly into DVDSP. Is that in sync? How about iDVD? 2. How are you ascertaining whether the resulting movie is in sync? 3. You are incorrect in your last paragraph- you can bring a 200 GB uncompressed 2 hour movie into DVDSP and DVDSP will compress it to fit on a 4.3 GB DVD. Hey, I havn’t seen the results of these settings yet, it’s saving now. But like Julia said, it says the quality is “medium” after I changed it to PNG. It changes in the options menu from high quality after you press ok in the compression settings. Should that be changing? Does yours change? Does that thing know what it’s talking about? Or does it just assume it will be normal with the different settings? The quality will be perfect. Disregard the “medium” setting. I cannot export to dvd with imovie HD. I tried converting to Quicktime but the quality was so poor. Any suggestions on what i could do? I tried exporting to a .mov file but the quality was horrible. Any suggestions for settings under the advanced tab? Please respond asap!!!!! thanks. Did you export using the process in the article above? H.264, Rate: 29.97 fps, Quality: Best, Data Rate: Automatic; Size Settings: Dimensions: HD 1280 x 720 16:9; Sound Settings: Format: Linear PCM, Channels: Stereo (L R), Rate: 48.000, Render Settings: Best, Sample size: 16 bits, Little Endian (checked). I really liked the quality of these video clips. But now, I want to put them together with chapter marks using Final Cut Express, but when creating the “one” video, the quality is reduced significantly. By doing this, am I compressing those video clips again? Is this the reason why I get very poor quality with FCE. What am I doing wrong? How do I fix this problem? How can I keep the quality presented in the video clips previously compressed? I am really lost and any help would really be appreciated. I just don’t have time for trial and error. Rendering these videos take hours! I start feeling frustrated. I recently followed the instructions above for a high quality movie. AMAZING quality when coupled with DV Kitchen to a quick specs! I followed all png export directions to the “t”… but when I dropped the png file into DVDSP… the video on burned disc was very poor quality and the sound was even a bit warped. I tried another disc and had the same results. Should I just drag the png into DV Kitchen and encode it to DV NTSC Widescreen? What bitrate did you use? Try increasing it. Is there a way to export a highest quality version, but keep the chapter markers? You could do METHOD #1 and include markers, then extract that track and add it to your other high quality movie… what format is your footage? They are Quick Time Movies, just imported from a DV tape. I exported with Method #1, and have also exported a high quality PNG movie. How can I extract the first track and add it to the PNG movie? When exporting 20 min of a 90 min film the exporting crash about 30% of working. telling me Error:file too big. I don´t know the problem because i have a 500 gyga bytes free space in my external hard disk its only 20 min im exporting. Whats wrong? I’VE GOT A REALLY IMPORTANT QUESTION FOR ALL THE PROS OUT THERE!!! I’m following these stpes, but when I filmed my short film, I used an HD (AVCHD) camera. –it’s 1920×1080. when selecting size, should I still use 720×405 or should I select 1920×1080 HD?! PLEASEEEE SOMEONE ANSWER ME! YOU DON’T KNOW HOW IMPORTANT THIS IS!!! — it would be great if you replied directly to me at nikolas.onthego@gmail.com! THANK YOU SO MUCH EVERYON! Awesome stuff but is there no way to make the file size a tad smaller? It’s a big file because it’s lossless. You could try PJPEG codec at 90% and see if you’re happy with the quality. Tried Option #3. Worked great for the photos and titles in my FCE project but seems to make the video quality poorer (choppy). It is just regular DV footage. Anything I could be doing wrong ? The video quality is fine, it is just not playing smoothly on your machine, but the file is meant as an intermediate, not to be played directly. Run it through DV Kitchen to play from your hard drive or the web. I’m converting old VCR tapes to DVD. I have iMovie 06 HD, iMovie ’08, FCE 3.5, and I’ve just ordered FCE 4.0. I have a 1.5 TB external HD – Space is NO issue. I don’t care how big of a file(s) I create, I just want the best quality I can get from a VHS tape, to the DVD. I can burn 4.7 and 8 gig disks. Any recommendations or settings I should do? I am using iMovie HD for editing (sound won’t port over to FCE 3.5) and then iDVD 08 for burning in Professional quality. I always keep it well under limit of space. For Recording, I have the Canopus ADVC 300 on firewire 400. Quality is cleaned up a bit from it. It’s burning and viewing where the disappointment comes from. Looks really grainy. BTW, I’m not sure, but I take it we can’t buy iDVD pro without buying FCP, right? I wish there was a really good Pro-sumer version of iDVD like there is a Pro-sumer of Video editing (FCE). Hi, I have a 6 and a half minute long music video which i need to export both onto youtube and onto DVD for examiners (this is for my A-Level coursework). It is shot on 3 seperate domestic DV cameras, 2 of which were 16:9 aspect and 1 was 4:3. I cancelled out the changes in FCE by just scaling up the 16:9 footage to 135% so it filled the viewer slug with no widescreen bands at the top and bottom. I followed the steps above exactly to try and export with high quality and as promised, the LiveType animations at the beginning are higher quality, but the video has lost its contrast and has become very ‘liney’- it has many small horizontal lines which seem to worsen with movement. Fast movement such as a drumstick is also lagging slightly, so the image appears to have a trail, and the audio has slightly gone out of sync. Is this something that i’ve done wrong, or is there anything that i can do to fix it? Any comments/answers would be greatly appreciated, and as my deadline is fast approaching, time is a factor! I have a 9 minute video in FCP 7 and the sequence is rendered. 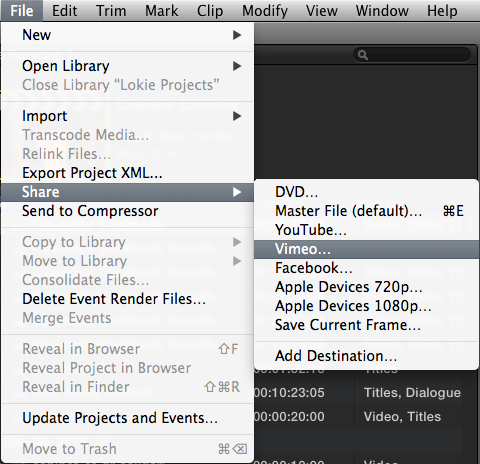 When I go to export the video with the first option the file still takes about an hour on my brand new MacBook Pro. I also tried to do the same thing before I rendered the sequence and it was the same amount of time. Not sure what is the problem, but I just can’t believe how long it takes. I also tried to convert the file in Compressor for 1920×1080 H.264 so I could upload the file to Smug Mug. I am not using any of the frame controls or anything frame rate conversions or anything and it says it will take almost 6 hours. I did go through the Compressor trouble shooting files and cleaned out everything. I even ran the Compressor Fix program that has been mentioned online at several forums and I also checked the permissions and everything I could find to check. But the program is still just really slow. Am I missing something here? Are there presets you can download somewhere for Compressor…new presets that handle straight FULL HD conversions for the newer video sharing sites that actually take 1920×1080 files in H.264? We have several computers here at the office and one of them has the Adobe Suite. I took the MOV intermediate over to the PC with CS4 and ran it through the Adobe media tool. It took about one an half times real time or about 16 minutes and the file looks great! This would be a real pain if I have to do this every time. We do a lot of long form edits, but I have not had to put those online yet. I cannot imagine going through all this for a 30 or 60 minute video in HD. I think the new version of Final Cut will be out before the file finishes rendering out of Compressor. Hi, i’ve tried this method and is happy with the quality, though it seems to be interlacing my cross dissolves. Any suggestions on what I should do to solve this? You could set your sequence to progressive by setting Field order to “None”. hey, i did the lossless PNG method for a project i plan to put on dvd. (i just ordered ilife 09 and some verbatim dual layer dvdrs) the quality looks good but my project is less than 30 minutes long and the file came out as 18.89 Gigs, which i will never be able to fit on a dvd. my stuff is pretty edit heavy so i guess that is why it is so big? im relatively new to this so i dont necessarily understand much about compression. basically i have six of these 30 minute or so projects shot in full HD (avchd) and they are heavily edited and i need to get them on DVD, looks like i will need a separate one for each project and im okay with that, but not thrilled. any help? The file is just an intermediate and size doesn’t matter – it will be encoded to MPEG2 to go on the DVD and will be much smaller. You can fit 90 – 120 minutes of video on a DVD at fairly decent quality. !Warning: The file VOB_DATA.LAY found in the VIDEO_TS or HVDVD_TS folder will not be included in the final disc. !Warning: The file WITHOUT_REGARD.layout found in the VIDEO_TS or HVDVD_TS folder will not be included in the final disc. Without_regard is my DVD name..
Any idea why or how I can fix this problem?? I’m trying to burn stuff by WED! nevermind – I went to my college’s Video Prod center and they just told me to build/format to my hard drive as a .img file – then I used disc utility to burn to a DVD. I’m editing a 4 min. music video on Final Cut. I shot the videos with the Canon 5D Mark II at 1920×1080 HD. If I do the exporting as described on your method at 720×405 everything looks perfect! But when I try to do it at 1920×1080, or even at 1080×720, I cannot see the video normally on my computer, it stops every 2 sec. Maybe the file is too big for streaming on my MacPro but it make no sense as I can watch perfectly other files with similar weight not processed, originally from my camera canon 5D mark II. The studio that’s going convert my clip into several formats (DVD, AVI PAL for Tv Brodcast and Beta) asked me to send them the file at 4:2:2 10bits, pro-ress 4:4:4 or DVCPro50/HD. Can I just send them the converted file as described on your method 3 or is it too small comparing to what they are asking me for? I tried exporting at the 4:2:2 10bits non compressed and the file is too large (33GB), contrast and pixels are worst than the PNG compression and I cannot watch the film correctly on my computer as described before. The exported file may not play smoothly, but it’s just an intermediate, so no big deal. 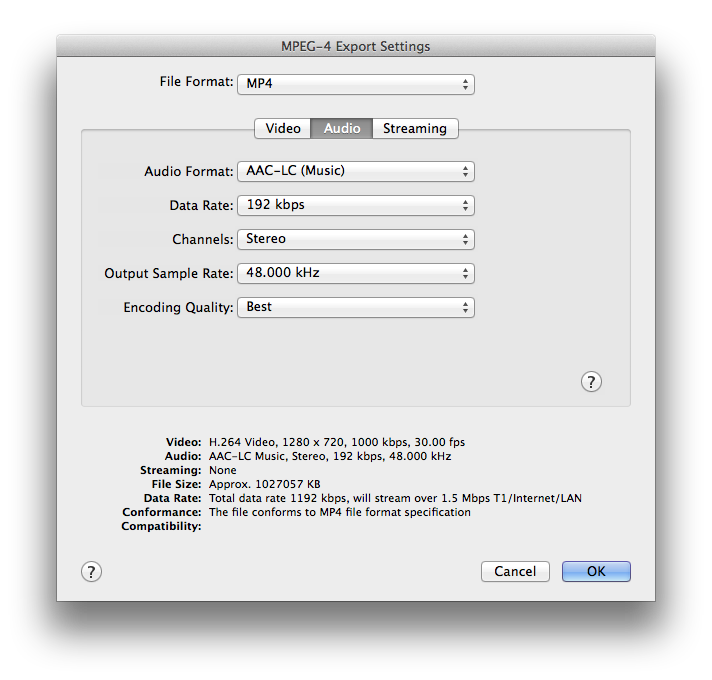 You can export in any of the formats you mention using the process above, just choose a different codec. This is the most helpful article ever! I was exporting for film festivals, and the quality was so shocking! Now you have taught me to keep all the quality, and the film looks great. Thank you so much. You have really helped me. I also found the Exporting Reference Movie helpful. For referencing it is actually brilliant! I followed the steps above to maintain the quality of a PNG file I wanted to use in a short video I put together. When I export the video, however, the audio and video is out of sync. There are no issues with the video, and the PNG file looks better, but I can’t figure out how/why the audio is messed up in the Quicktime file I created. I am not looking to convert this onto a DVD, but rather put it on YouTube. What can I do to fix this? I have an 80 minutes movie and I want to create the best quality dvd possible. I will export as PNG as described on the method above, but after that, is it helpfull to use DVD-9 in order to reduce the compression? or you recommend to use a simple DVD-5? Has Dvd Studio Pro these two options? the last question … i promise 🙂 … what exactly makes export … it compress and finds the best choise of quality parameters ? … ok then what exactly makes copression of exported file ? … it compress more with absolutely lossless quality ???????? i worry about quality all the time … i give so much energy to make a good movie then it should be the best quality ! it should have at least the raw quality parameters, it should look like original, if not i am always confused ….. but the trend is small filesize, but for me …. quality should decide !!! quality is n.1! ….. what can i do ?????????? Should be all good now. I exported either HDV1080 25 p timeline, as a png copy as suggested with the aim of importing it to IDVD. It looked good but I lost the 16:9 shape for a 3:4 so everything looks squeezed. Hi, thank you for this. I have been exporting PNG since I read this, but the option is no longer available with Lion. Do you know of a workaround/alternative for a lossless export? Are you editing with Pro Res? This is probably the best export format. When I export my scene I lose color and image quality. How do I fix this? I have made sure my sequence is in the same format as my clips. And my export is the same. I still get pixilation. Help me! Can you describe how you’re exporting? How should I export if I want the best quality. The best possible. I have the entire FCP studio and a Canon 5D. Thank you. My students are using HD video (it records as AVCHD 1080 x 1920) and we’re also using final cut express. When creating the project I just want to make sure I’m selecting the correct format. I’m getting students to select HDV Apple Intermediate Codec 1080i50 from the project set up menu. 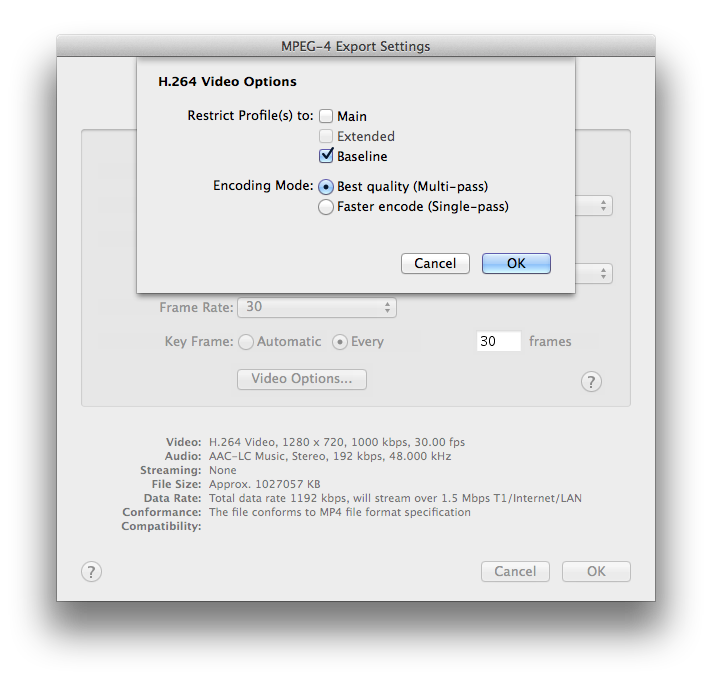 Second question: When exporting how is PNG better than H.264? I’d like to keep the good quality, the 1080 x 1920 and as smaller file size as possible. I read that a PNG movie has a huge file size. So which is better for my needs? Where is the video destined to end up? On YouTube or maybe a DVD? The format you export in would depend on that. My proj. is in this case…. then i edit but i need to export…but how? Small question I have. Iam a new user of iMovie and I made a project of my kids rehearsal about 16gb hd movie plus hd photos. i followed the steps you mentioned to make it ready for burn dvd. But actually the dvd has a capacity of 4gb. Question: how can I zip the 16gb project and write on a 4 gb dvd as a movie ?? iDVD will make the movie fit. I previously followed the instructions above and exported high quality (but large) PNG movies in the .mov container. I am trying to export a movie now, but can’t find the PNG option – am I going mad or has option been removed, and if so, what is the next best option? Altho the footage is dv and not the best quality, from the options I have tried I still end up with blocking in dark areas and the titles which are sharp in iMovie are soft and dull when exported. The options to increase bit rate, etc are greyed out in most options also. What is the destination for the movie? DVD or web? Thanks, but the only export options in iMovie are are h.264, dv, Animation and mpeg4. I can’t find ProRes as an option. I am looking for highest quality for DVD and archiving. 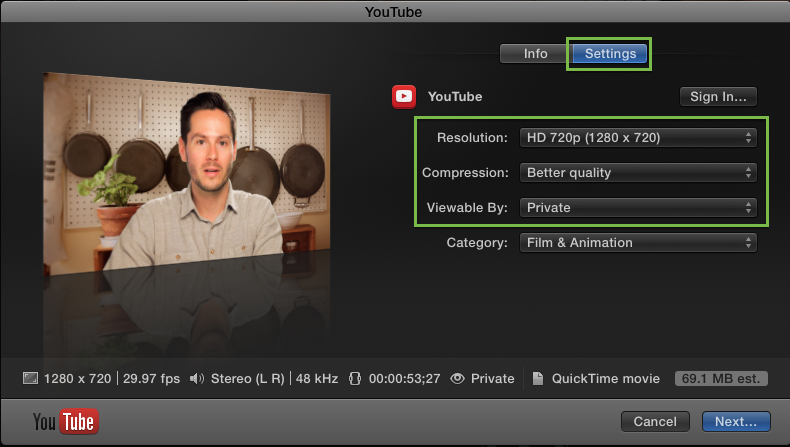 The H.264 compressor option seems to be the best quality so far but it is not at same standard as PNG. Do I have to accept this as a limitation of iMovie? Under the compression menu there 10 options including 5 for DV, AIC and Photo-JPEG. I have the screenshot, but am not able to attach it. I am sure that previously there were far more options under this menu. I have a short film that is 768 x 576 and I used your instructions and it works well. My video is about 3 minutes long and the size of the Exported File is around 130 MB now. Now my Question: Will this file be good enough for a Projection on a Big Screen? Because I am sending it to a Film Festival! Or should I export the film differently in this case? Is there a way for me to get it to 1080P? Or is it impossible seeing that my film’s size is 768 x 576? I export using the same settings atleast thrice a day. 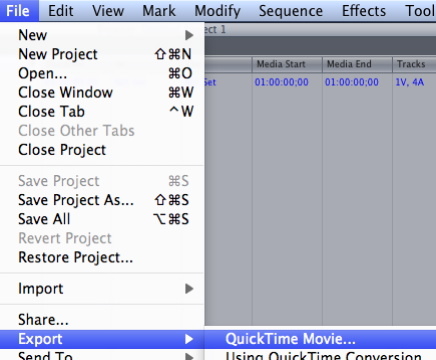 Is there anyway I can save quicktime converstion settings as a preset. 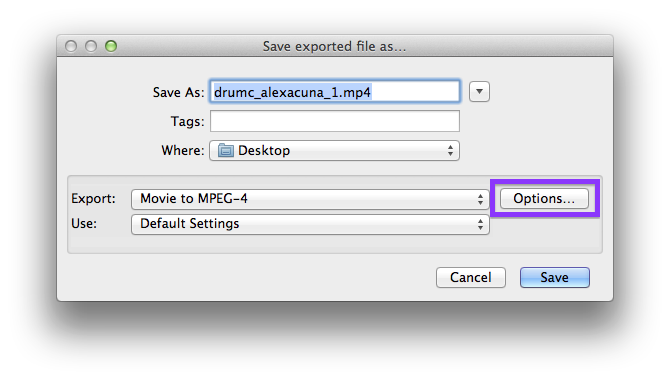 Sorry for the delay, but there isn’t a way in FCP7 to store QT export settings. Hi Josh, i have a problem with my mov. It exports well with the option of make movie self contained, and the it runs well (bit it makes other files that says nameofclip-av1, 2 and so on). When i re run it all clips stop at min 4:10 or 4:15. I checked up all settings and they are good. I made an export from the mov to a flv and the flv runs good. What is happening to the mov’s? Can you help? Mariana, it sounds like your disk is formatted so that it can only contain a 2 GB max file size. What disk are you exporting to? also, don’t forget that fcp7 gives you way more control over render quality than fcpX! open your sequence settings and go to “video processing” tab. you can there select “10bit YUV rendering” which takes twice as long but extremely improves the final quality when using many effects or working with real 10bit material. also there is an option to set the quality of the “motion” tab to “best”. recommended for any scaling! fcpX has all of that built in and does everything by the books. the only thing you can really choose yourself is the quality of retiming effects (“optical flow” being the utmost best but longest to render). it lacks the codec options though. for example setting the automatic gamma adjustment of ProRes to “None” is gone. i somehow preferred the legacy controls of the export process and somehow feel like fcpX only gives me “youtube options” in export. 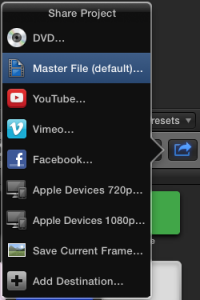 even the “master clip export” has no real settings. adobe’s premiere for example features all the fcp7 settings and more (eventough you need to to a little bit of fiddling to make it work with all the quicktime codecs, ssay the ProRes family in both import and export). as a paranoid quality-fetishist (i do lots of cinematic DCP processing) i prefer having those options but fcpX has other advantages. you can always use compressor for the export process.